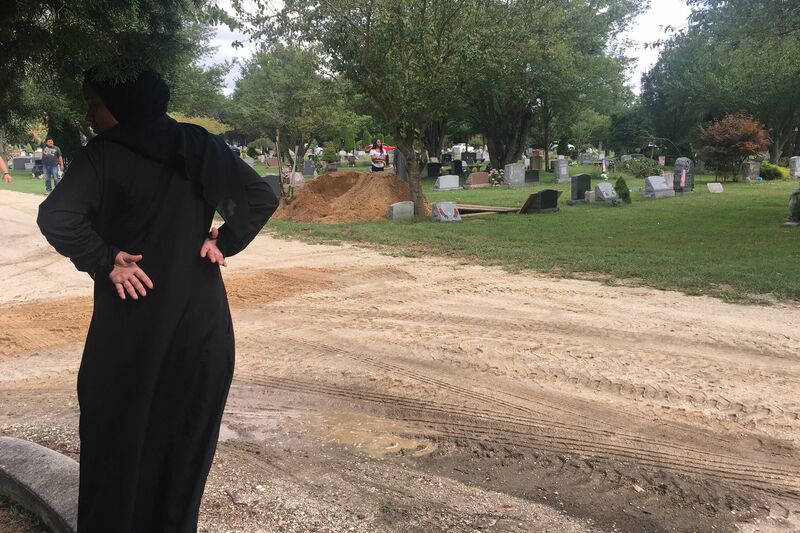 Natasha Stackhouse, 28, looks toward the grave of Qa’Id Muhammad at Seaside Cemetery in Cape May County Wednesday morning. UPPER TWP., N.J. — A woman in black wandered alone through a cemetery here Wednesday morning, her eyes passing from headstone to headstone. Soon a hearse would pull onto the sandy path and park beside a pear tree. Five shovels were spiked into a mound of dirt beside it. A grave had been dug, and down in it, a shallower grave, just wide enough to fit Qa'Id Muhammad's body, had been carved out. Natasha Stackhouse came to mourn Muhammad, a beloved, undefeated boxer and former Olympic team alternate from Atlantic City, but she was early, and it gave her a moment to speak to another victim of gun violence, her brother. He was gunned down in Atlantic City just before Christmas 2014. Many of the dead here, she said, were murdered in the city, like her brother. "Too young. Too young," she said, touching her brother's headstone. But Muhammad had left Atlantic City, she said, and he was training again in Nevada after a long hiatus. The Las Vegas Review Journal said Muhammad, 29, was shot in the torso, his body taken to a desert area off a Henderson street. Hundreds had turned out for his janazah earlier in the morning in Atlantic City, including dozens of firefighters who lined up outside of the All Wars Memorial on Adriatic Avenue. The PAL gym where Muhammad trained as a youth was just blocks away. "You move to another place to try to make your life better and leave this and look what happens," Stackhouse said. A crowd gathered around the grave 10 minutes later, many in traditional Muslim garb. One woman held a bouquet of sunflowers and black boxing gloves. A boy leaned against the pear tree, trying to rub the tears off his face. A half-dozen men lifted Muhammad, wrapped in white cloth, from the silver coffin, and the crowd parted to let them through. "Bend your knees," one man grunted, sweat dripping down his brow. Eight hands reached up from the grave. Slowly, three of the boxer's younger brothers took the weight from the men above. Muhammad's father, Abdur Rahim Muhammad, was in the grave, too. He held Qa'Id close and said, "goodbye." He held his son that way on a Thursday in April back in 1989, the day he welcomed his firstborn to the world. The father rested his son's head on a ledge in the grave. Mourners gather at Seaside Cemetery in Cape May County to pay respects to Qa’Id Muhammad, a boxer who was shot and killed in Nevada last week. One by one, the father and his three sons were lifted from the grave, leaving Qa'Id behind. Plywood was placed over the shallow grave and the first shovelful of dirt made a hollow thud against it. Shovels were passed around, and some just used their hands to grab the dirt. No one said much. Osnel Charles, a boxer from Atlantic City, grabbed a shovel and dug extra deep into the pile, looking both broken and angry about what he was doing. "See you later, champ," Charles said as he tossed dirt into the grave. "You owe me another round." Charles then moved to the outer circle of the crowd, bent down, and cried. "He was like my little brother," he said. Muhammad went by "Kid Dynamite" in the ring. He fought eight times, mostly in Atlantic City, and never lost but hadn't fought since a 2012 knockout at a casino in Mississippi. Muhammad was an alternate for the 2008 Olympic boxing team. At his brief janazah earlier in the city, mourners signed a picture of him in his boxing trunks. Mourners take photos and sign a memorial for boxer Qa’Id Muhammad, who was fatally shot in Nevada last week. According to a report in the Press of Atlantic City, a hand injury and run-ins with the law put Muhammad's career on pause. He pleaded guilty in 2014, the paper reported, in connection with a 2012 episode in Atlantic City in which he was accused of assaulting a man and removing him from a vehicle. Muhammad moved to Las Vegas in 2016, the paper reported, and was training at a boxing club owned by legendary fighter Floyd Mayweather Jr. Muhammad was on his way to train when he was killed, his father said. "I lost my son, my friend," Muhammad's father said, his hands still dirty. "He was the first person who believed in me." Abdur said police in Henderson were thorough. A suspect, Ryan Small, 38, was arrested and charged with murder, the department said on its Facebook page. Although Abdur said his son's shooting was not drug related, Henderson police said on Facebook that it "may have been." Qa’Id Muhammad’s father, Abdur Rahim Muhammad, embraces Osnel Charles after the burial Wednesday. A tractor helped push dirt closer to the grave, and many people paused to feel it in their hands before throwing it in. Charles had removed his suit jacket, sweat drenched through, and he tossed handfuls of dirt into the grave. When the grave was covered over, Muhammad's uncle, Haneef Shaqur, made a plea to all around him to remember the moment, the dirt on their hands, the young man wrapped in cloth. "If you allow this young man, who we all loved, with a beautiful smile and infectious personality, if you allow him to be buried and you go out and do the same things you've been doing, he ain't the only who's dead," Shaqur said. "If you're going to celebrate by smoking or drinking and think you're giving him love, that ain't love." Shaqur said "Q" will leave his possessions behind. His family would leave the cemetery. Then the angels will come to him, sit him up, and he will be judged by his deeds. "Open your eyes, Qa'Id," the angels will say.